We are delighted to announce the arrival in March of Chef Kevin Roehrig and his wife Audrey. They met at the Waterside Inn at Bray, and later moved from to Geranium in Copenhagen. From 1 April 2019 Kevin will be providing cooking classes, tasting lunches and evening private dining at Les Deux Chevres. Other eating options in the village include: Chez Guy and Bistrot Lucien. 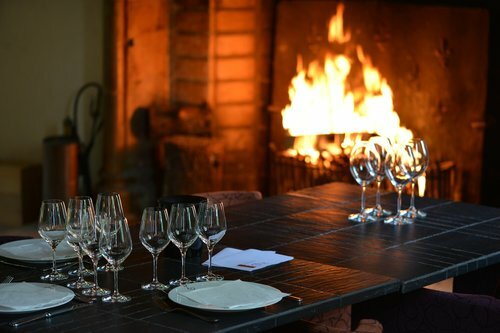 There is also a lunchtime only eaterie, Le Clos Lenoir, on the Route Nationale, and Domaine Trapet serves a tasting lunch in a delightful environment in the centre of the village. For young children, a good option is the restaurant in the Sports Complex, or the Pizzeria in the centre of the village. In the nearby villages, both Castel Tres Girard in Morey St Denis and Au Clos Napoléon in Fixin operate a free 'call and collect' service to Les Deux Chèvres for evening dining before 19.30. A nice option in the hills behind Gevrey is Au Petit Bonheur, which is in the ancient village of Curtil Vergy on the side of the Hill of Vergy. In Nuits St Georges, La Cabotte is an excellent address for lunch and dinner. In Dijon, our favourite value for money/quality of ingredients is the restaurant DZ Envies (next to the market), which serves fresh, organic produce in a bistro style environment. It is popular with the Dijonaise at lunchtime and requires reservations. A bit more upmarket is Maison des Cariatides, which deservedly earned a Michelin Star in 2017 for its excellent quality, value, 7-course prix fixe tasting menu with changing seasonal ingredients. It lost its star following the departure of talented young chef Angelo Ferrigno, but the quality of the cooking is still excellent, and we are waiting for news of Angelo’s new venture in Dijon. Two Michelin Star prices and service can be found at William Fraichot; while Stephan Derbord and Loiseau des Ducs (opposite the Palais des Ducs) each also have one Michelin Star, respectively, and both offer reliable gastronomic fare.